Many consider the shamrock to be a symbol of rebirth and life, making it a fitting symbol for St. Patrick’s Day, which happens to occur around the same time as the Spring Equinox in the Northern Hemisphere. 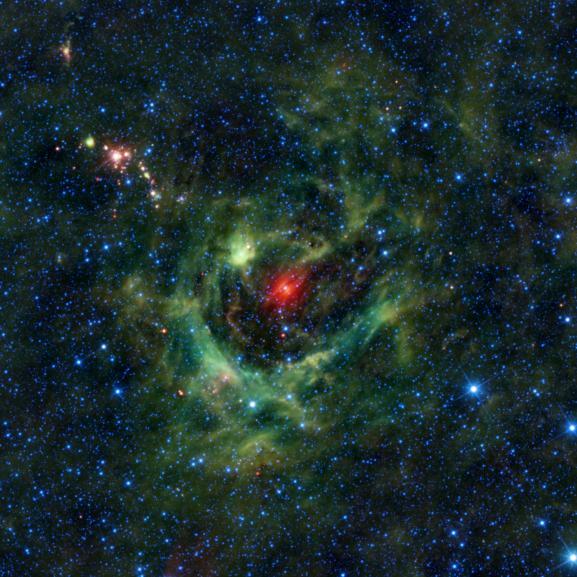 It is also fitting that today’s image from NASA’s Wide-field Infrared Survey Explorer, or WISE, features a region of star birth wrapped in a blanket of dust, colored green in this infrared view. Designated as LBN 149.02-00.13 (or Sh2-205 in the Sharpless catalog of nebulas), this interstellar cloud of dust and gas is a classic example of what astronomers call an HII region, because of all the ionized hydrogen, or HII, within it. Ionized gases carry an electric charge. This stellar nursery is made up of a shell of ionized gas surrounding a void with an extremely hot, bright star in the middle. With strong stellar winds and intense ultraviolet radiation, the central star — CY Camelopardalis — both clears away nearby gas and dust and heats the remaining dust in the shell, causing it to glow in the infrared wavelengths that WISE detected. The dust in the surrounding shell, colored green in this image, is mostly made of polycyclic aromatic hydrocarbon grains, similar to soot. They are warmer in temperature than the more metallic dust grains seen glowing in red around CY Cam. The heavy elements in such dust particles are cooked up in previous generations of stars and then incorporated into the new stars that are born from the cloud. This really is a region of rebirth and life. Scattered throughout the region you can see small clusters of bright red objects, especially near the upper left portion of the image. These are likely “Young Stellar Objects,” surrounded by cocoons of dense dust. Young Stellar Objects are stars in their earliest stages of life, just coming together and beginning to start their nuclear fusion. The clouds of gas and dust surrounding each star provide the material from which future planets might possibly form. Perhaps we are seeing the birth of several new planetary systems in this one image alone. JPL manages the Wide-field Infrared Survey Explorer for NASA’s Science Mission Directorate, Washington. The principal investigator, Edward Wright, is at UCLA. The mission was competitively selected under NASA’s Explorers Program managed by the Goddard Space Flight Center, Greenbelt, Md. The science instrument was built by the Space Dynamics Laboratory, Logan, Utah, and the spacecraft was built by Ball Aerospace & Technologies Corp., Boulder, Colo. Science operations and data processing take place at the Infrared Processing and Analysis Center at the California Institute of Technology in Pasadena.